An isometric, real-time, tactical stealth-'em-up. 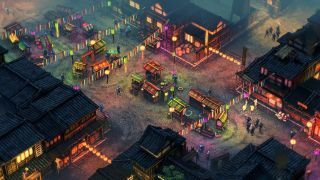 Andy covered the announcement of the promising Shadow Tactics: Blades of the Shogun, which is basically a modern-day version of Commandos, but in Edo-era Japan. You can download a demo right now, but if you want to exchange money for a full version of Mimimi Productions' isometric, tactical stealth game (man, what a weird idea), you can finally do so today, as today is when Shadow Tactics is out. You can grab the game (and, indeed, the demo) on Steam or from GOG or on Humble, or at least you can when the game goes live in a couple of hours. Shadow Tactics has garnered a positive reaction so far, so if you're a fan of the Commandos or Desperados games—or that one isometric Robin Hood—you should probably check it out.